The Arena frame is handcrafted in the USA and made with 100% recycled wood. The 16" X 16" frame features black moulding surrounding a black mat underlined with purple and holds an 8" X 10" diploma. 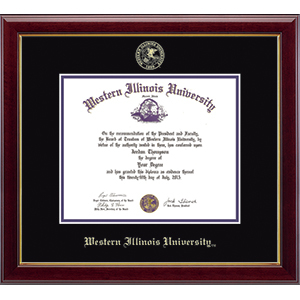 Show off your accomplishment and Western Illinois University pride with this diploma frame. This hardwood frame has a black satin finish with a silver lip. The official seal is stamped in gold on the matting, along with Western Illinois University. 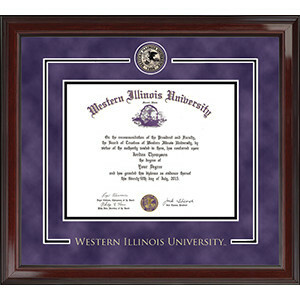 Show off your accomplishment and Western Illinois University pride with this diploma frame. This hardwood frame has a black suede finish. The official seal is stamped in gold on the matting, along with Western Illinois University. eatures a beautiful photo of the Sherman Hall building mounted above your diploma, with your school name and seal gold embossed on black museum-quality matting. It is frame in Acadia moulding made with 100% recycled wood and has a Brazilian walnut finish. This frame fits a Bachelor's, Master's and PhD degree. Document Size: 8.5"h x 11"w Approx. Overall Frame Size: 19.5"w x 24.5"h Includes our easy-to-use Level-Lock Frame Hanging System! This custom frame is handcrafted in the USA. Showcases a gold engraved medallion of the Western Illinois University seal. Shown in high-gloss Cordova moulding crafted of solid hardwood with a cherry finish. This frame fits a Bachelor's, Master's or PhD degree. Document Size: 8.5"h x 11"w Approx. Overall Frame Size: 11.8"h x 14.3"w This custom frame is handcrafted in the USA. This hardwood frame has a cherry-gloss finish with a gold lip. A gold coin seal is embossed on the black matting, as well as Western Illinois University. This frame is 15" X 12.33." You worked hard for your diploma, so why not show it off? This hardwood frame is 15.5" x 17.5" and has a cherry satin finish. 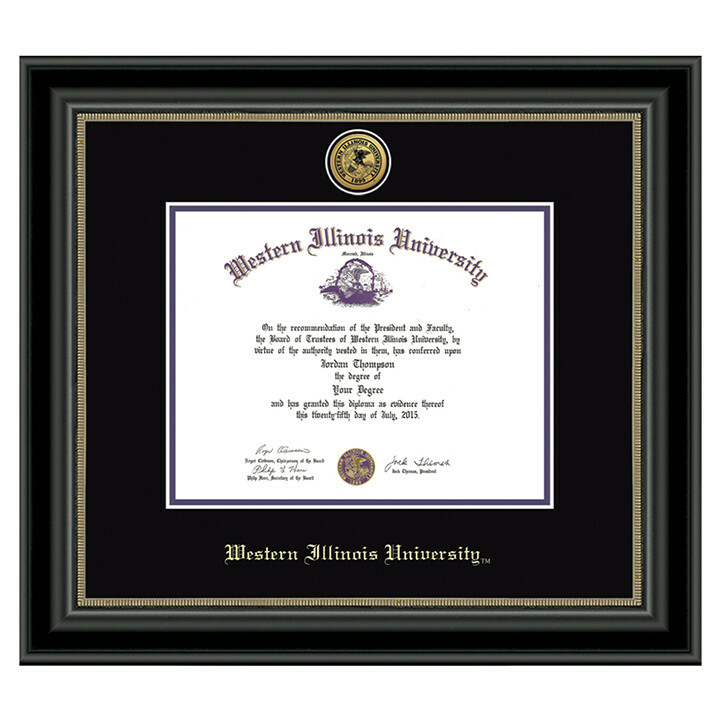 The embossed, official seal is on black matting in gold print while Western Illinois University is printed to match. This frame holds an 8" x 10" diploma. You worked hard for that diploma - show it off in grand style! 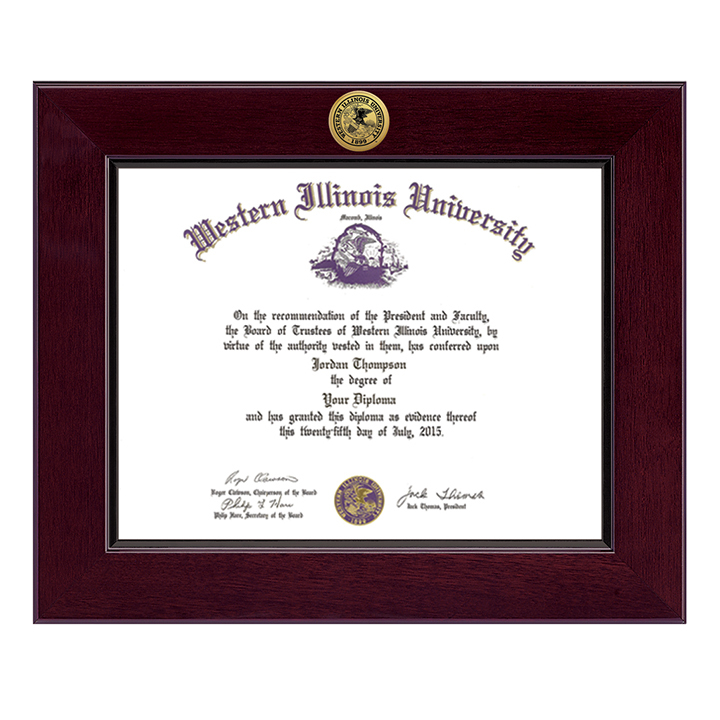 Our Gallery diploma frame features the Western Illinois University name and official seal in gold embossing on black matting which is underlined in purple. 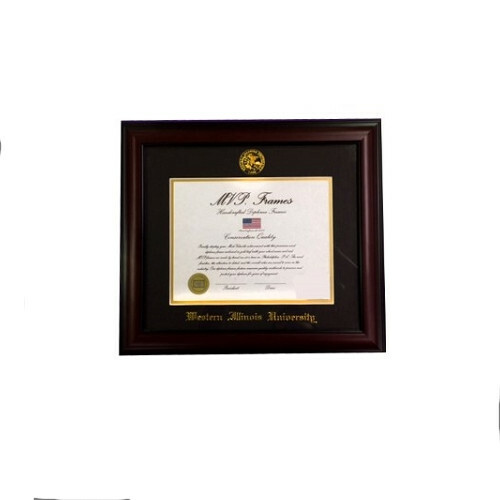 The 16" X 18" hardwood frame has a high-gloss cherry lacquer finish with a gold lip and holds an 8" X 10" diploma. Display your graduation tassel in a shadowbox alongside your diploma. 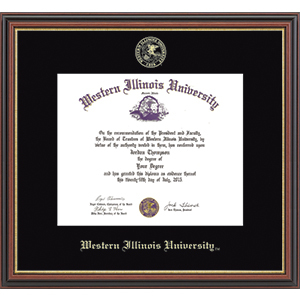 Our University seal and Western Illinois University are in gold foil embossed on black museum-quality matting which holds your 8" X 10" diploma. The hardwood moulding is in a cherry finish with black accents and a gold lip. The overall size of the frame is 15" X 20". 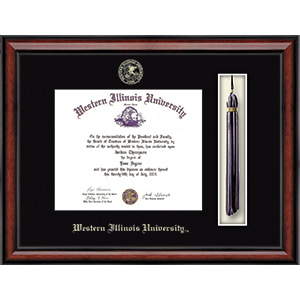 Features a gold engraved medallion of the Western Illinois University seal set into a 23k bezel within black and purple museum-quality matting and the school name gold embossed below. It is framed in Noir moulding crafted of solid hardwood with a black satin finish and two-toned inner lip. This frame fits a Bachelors, Masters and PhD degree. Document Size: 8.5"h x 11"w Approx. Overall Frame Size: 16.8"h x 19.3"w Includes our easy-to-use Level-Lock Frame Hanging System! This custom frame is handcrafted in the USA. 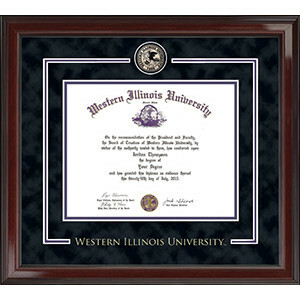 Show off your accomplishment and Western Illinois University pride with this diploma frame. This hardwood frame has a purple suede finish. The official seal is stamped in gold on the matting, along with Western Illinois University. 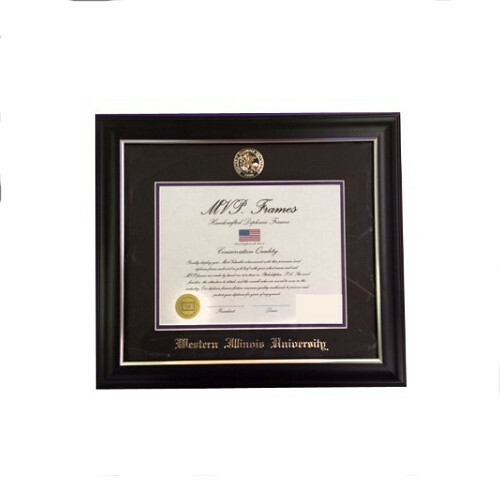 Display your hard-earned diploma in this economically priced 16" X 16" frame. The mahogany colored frame is handcrafted in the USA and made with 100% recycled wood. The black mat is accented with a purple mat underneath. 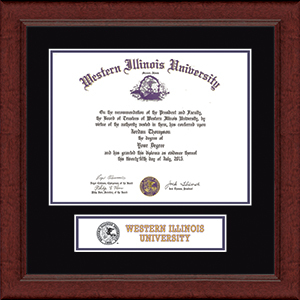 Show off your accomplishment and Western Illinois University pride with this diploma frame. The official seal is stamped in gold on the matting, along with Western Illinois University. 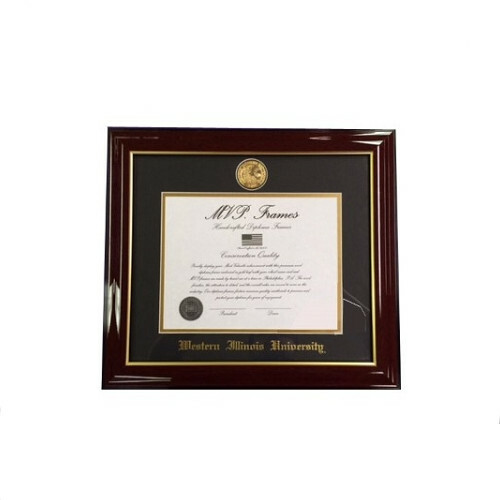 Our top selling diploma frame has a rich mahogany finish with an inner gold lip. 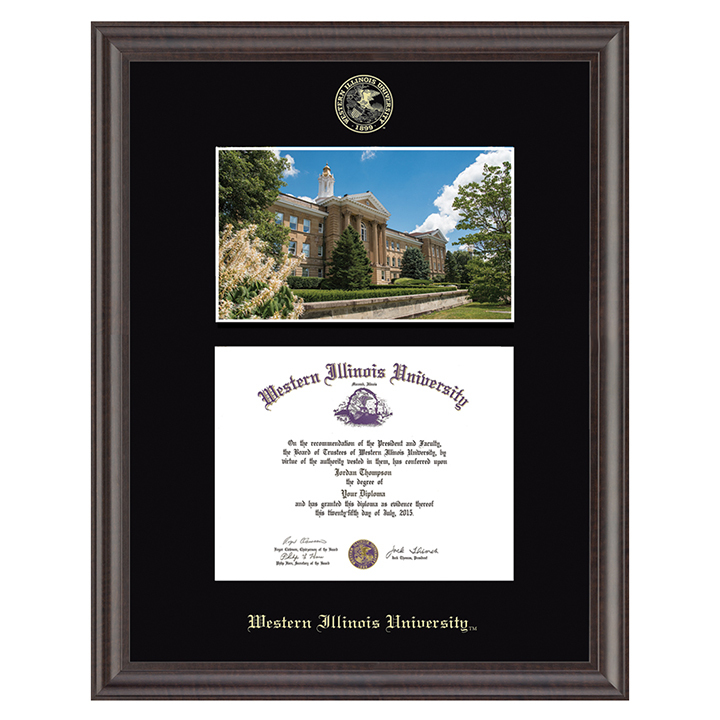 The 15" X 17" frame features the Western Illinois University name and official seal in gold embossing on black museum-quality matting. This frame will hold an 8" X 10" diploma. 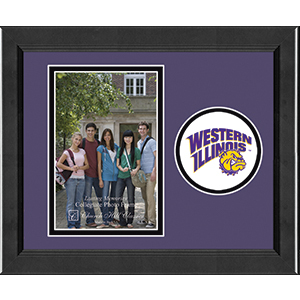 Save the memories with this WIU picture frame. Black frame with purple mat background. Holds a 4x6 horizontal picture on the left and has a circular WIU logo with Rocky head on the right. 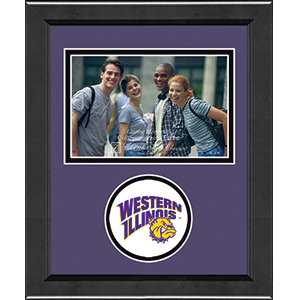 Save the memories with this WIU picture frame. Black frame with purple mat background. Holds a 6x4 vertical picture on the left and has a circular WIU logo with Rocky head on the right.